Mercedes’ Niki Lauda and Red Bull’s Dr Helmut Marko were their usual outspoken selves when discussing the futures of Lewis Hamilton and Daniel Ricciardo. 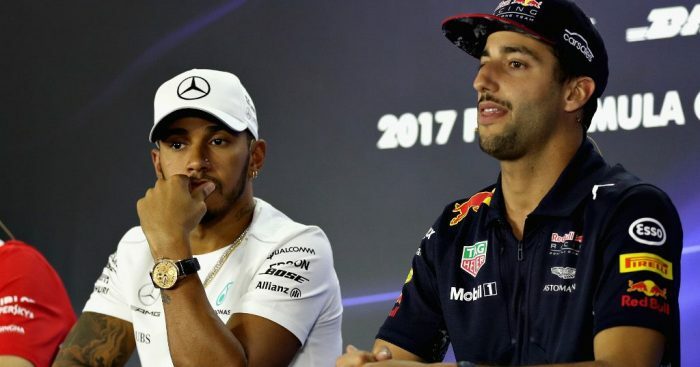 Both drivers are out of contract at the end of the season and neither of them have committed their long-term futures at this stage. And, at an event hosted by the Red Bull Ring where Marc Marquez tested the RB08 in Toro Rosso colours, Lauda and Marko gave their unique insights into the current contract situation. “Lewis will sign. We only discuss details, not the money,” Lauda said via Kronen Zeitung. To which Marko replied: “I hope that finally gets signed. Because Ricciardo says that, as long as Hamilton is not yet contracted to Mercedes, he also does not want to sign. Lauda then suggested Ricciardo was playing a smart game and stirred the pot a little more. “Ricciardo blackmailed you with Hamilton, who has not yet signed. What Hamilton gets, he can not get anyway. So. We have not made him an offer,” Lauda added. Marko countered by hinting that Ricciardo would not be welcome by all at Mercedes. “He [Ricciardo] should now sign with you.” Marko responded. Marko also reiterated that Red Bull’s decision on their engine partner for next season and beyond is set to be finalised by early next month.